of over 38 million. Its capital is Warsaw. Poles make up almost 97 per cent of the country's population. Until 1939, one third of the population consisted of ethnic minorities. About 6 million people perished during World War II (including about 3.5 million Jews in the Shoah). Nowadays, ethnic minorities make up small percentage of Poland's population. The most numerous are Ukrainians, Belarusians, Germans (who are represented in parliament), Roma, Lithuanians, Slovaks and Czechs. Poles speak Polish, which belongs to the Slavonic family of languages. The law guarantees ethnic minorities the use of their own language. As a result of emigration for economic and political reasons which began in the 19th century, about 15 million Poles went to live outside the borders of their country. Currently the most numerous diasporas are expatriate Polish communities in the United States, Germany, Brazil, France and Canada. communities arose as a result of the missionary work of Cyril and Methodius. Church life in Poland became organised during the reign of the first historical ruler, Mieszko of the Piast family, who united the Slavonic tribes living in the Vistula river basin. 966, the date when Mieszko was baptized, is recognized as the year the Polish state was formed. The first archbishopric on Polish land to have independent jurisdiction was established in 1000 in Gniezno. In that year, three monarchs - German, Czech and Polish - met in congress at the grave of the bishop and martyr St. Wojciech (the contemporary congresses of Gniezno, Which have been organized since 1997, allude to that event with their international and ecumenical character). Boleslaw the Brave was the first to be crowned king of Poland, in 1025. He considerably extended the state's borders and supported missionary campaigns. Foreigners found a place for themselves and appealing living conditions on Polish lands from the very beginning. They were primarily Jews, Karaites (since the 12th century) and Muslim Tatars (since the 14th century). The 15th and 16th centuries are known as the golden age of Polish history. This was the time when political, economic and cultural brilliance was at its height. It was also the time when Reformation ideas reached Poland. The teachings of Martin Luther found favor with burghers, while those of John Calvin and Huldrych Zwingli attracted the aristocracy (former knights). Against the backdrop of western countries engaged in mutually destructive religious wars, Poland stood out for its considerable religious tolerance and became a refuge for Protestant dissidents. The 17th century was the period of the Counter-Reformation, when Protestants were deprived of political rights and Arians - the Polish Brethren - forced to emigrate, which put the brakes on effectively halted the development of Polish Protestantism. In 1791 the Sejm (the Polish parliament) passed the world's second constitution (after that of the United States), guaranteeing freedom of confession and religious practice. Unfortunately, between 1772 and 1795 Poland was partitioned on three separate occasions between the superpowers of Prussia, Russia and Austria. As a result, for 123 years the country did not exist on the map of Europe. Poles attempted to regain their independence in a series of national insurrections such as the Kosciuszko Uprising (1791), the November Uprising (1830), the Spring of Nations (1848), the January Uprising (1863) and revolution during World War One. Poland did not regain freedom and independence until 1918. The inter-war years (1918-1939) were a time of reconstructing the country's statehood after the ruinous policy of the partitioning powers and wartime destruction. The short period of independence (20 years) was also one of rapid growth. Poland emerged successfully from the global economic crisis in 1920-1930, its industry prospered, universal education was introduced, and conditions were created for the development of science and culture. One of the most tragic periods in Polish history was World War II (1939-1945). When Nazis Germans attacked the country on 1 September 1939, Poles spent six weeks fighting the invader's overwhelming military might. The situation became even more difficult when, on 17 September 1939, the Soviet Red Army annexed eastern parts of Poland. A resistance Home Army and underground state structures were formed on territory occupied by the Germans known as the General Government. In April 1943 an uprising broke out in the Warsaw ghetto (the sealed-off Jewish district). The entire Jewish district was methodically burnt and razed to the ground. In August 1944 the Warsaw Uprising broke out in the capital, in which about 200,000 insurgents and civilians were killed. When the uprising collapsed, the remaining population was displaced, and 95 per cent of the capital was demolished by the Nazis. Polish soldiers fought on many fronts all over the world: in Norway, England, Italy, Holland, the Soviet Union, the Middle East and Africa. After the war, in 1945, as a result of treaties signed by the United States, Great Britain and the Soviet Union in Yalta and Potsdam, Poland found itself within the Soviet sphere of influence and became a communist republic. Its previous borders were moved. The USSR took over Poland's eastern territories, and the western border was set along the Oder and Neisse rivers. Both these decisions had far-reaching political, economic, social and religious consequences. Millions of people of various nationalities were resettled or displaced. At the end of the 1970s the country faced economic collapse. Throughout Poland strikes occurred and discontent, which increased at this time, resulted in the formation of a powerful social and political movement. In 1980 the independent trade union 'Solidarity' was created, with about 10 million people members. It was led by Lech Walesa. The political transformations in the USSR ("perestroika") and the powerful trade union and independence movement in Poland contributed to the democratic changes in Europe, and brought sovereignty to Poland. In 1989 the political system changed to a parliamentary democracy with a return to a market economy. The first free parliamentary elections were held, and new political parties and extra-government organizations came into being. In 1999 Poland joined international structures of security (NATO) and economic exchange (WTO, OECD). Since 2004 the country has been a member of the European Union, chairing it from July to December 2011. The largest church in Poland is the Roman Catholic Church, to which about 95 per cent of the population belongs. This church has played a big part in preserving Polish national identity and independence down through the ages, particularly during the partitions (1772-1918) and in the communist period (1945-1989). The election of a Polish pope in 1978 was of tremendous significance for the social and political changes. John Paul II (who died in 2005) was known throughout the world for advocating respect for different religions, peace among nations, human dignity and freedom. The second biggest church is the Polish Orthodox Church (approximately 550,000 followers). Its origins are closely related to the missionary activities of saints Cyril and Methodius (9th century). Orthodoxy was a permanent feature of the country's religious structure. Since 1925 the Orthodox Church in Poland has had the status of an autocephalous church. recognized the Pope as the head of the Church and accepted Catholic dogma, while retaining the Byzantine rite. The Greek Catholic (Uniate) Church consequently came into being, which today has approximately 100,000 followers. The Evangelical Lutheran Church (about 75,000 followers) and the Evangelical Reformed (Calvinist) Church (about 3,500 followers) originated in the Reformation of the 16th century. The Evangelical Methodist Church (about 5,000 followers) and the Baptist Union (about 5,000 followers) have existed in Poland since the 19th century. There are also two churches which came into being at the turn of the 19th and 20th centuries and belong to the family of Old Catholic churches: the Mariavite Church and the Polish Catholic Church. The Old Catholic Mariavite Church (about 25,000 followers) separated from the Roman Catholic Church in 1906. The Polish Catholic Church arose among Polish expatriates in America. It numbers approximately 22,000 followers and belongs to the Union of Utrecht. There are also other Protestant churches active in Poland, such as the Pentecostal Church, the Seventh Day Adventist Church, the Fellowship of Christian Churches, and the Church of Evangelical Christians. Some of these churches are affiliated in the Evangelical Alliance. Poland is also home to religious groups such as the Union of Jewish Religious Communities, the Karaite Religious Union and the Muslim Religious Union. In previous centuries Poland was considerably more diversified in terms of confessions, taking pride in a long tradition of freedom, religious tolerance and ecumenical cooperation. The contemporary religious landscape is the consequence of many historical events, particularly World War II and its accompanying border shifts and mass migrations of people. The historical traditions of ecumenism in Poland reach back to the 16th century. In 1570 a notable event was the Sandomierz Agreement signed by Lutherans, Calvinists and Czech Hussites. In 1777, Lutherans and Calvinists formed a union; in 1828-1849 both confessions had a joint consistory. The first inter-denominational organization in Poland was the Polish Branch of the World Union for the Propagation of Friendship between Nations, which came into being in 1923 through the agency of churches. Initially, six churches belonging to the Lutheran, Reformed and United traditions belonged to the Polish Branch, resolving matters of dispute among themselves and engaging in joint actions. When the Polish Autocephalous Orthodox Church Joined the union in 1930, the possibility was realized for a historic meeting of two separate Christian traditions - Evangelical and Orthodox - in a joint organization. During World War II, towards the end of 1942, a Provisional Ecumenical Council was set up. It drew up the ecumenical "Confession of Faith of Polish Christians" (Polish Confession), formulating dogmatic principles regarded as a common good. Reformed, Evangelical Methodist, Baptist Union and Evangelical Christians - formed a joint official mission known as the Council of Protestant Churches in the Republic of Poland, whose chairman was Rev. Konstanty Najder, general superintendent of the Methodist Church. The Polish Ecumenical Council (PEC) was officially constituted in Warsaw on 15 November 1946. Delegates representing 12 confessions took part in this. Rev. Zygmunt Michelis (1890-1977) of the Evangelical Lutheran Church was elected chairman of the PEC. Until the end of the 1960s, relations between the Polish Ecumenical Council and the Roman Catholic Church had an unofficial character. However, many Catholics, both clergy and lay members, took part in services marking the Week of Prayer for Christian Unity, organized by PEC member churches. The first ecumenical service in a Catholic church, which took place before the Second Vatican Council with the participation of invited representatives of other Christian confessions, was held in St. Martin's church in Warsaw on 10 January 1962. This year (2012) is the fiftieth anniversary of that event. established between the Roman Catholic Church and the PEC. In 1977 the Mixed Committee appointed a Sub-committee for Dialogue, to be concerned with talks on theological subjects. Twenty years later (1997), on the basis of the cooperation to date, a Committee for Dialogue of the Conference of the Polish Episcopate and the Polish Ecumenical Council was established. One of the important results of the cooperation between the PEC and the Roman Catholic Church took place in 2000, when the heads of six member churches of the Polish Ecumenical Council and the Roman Catholic Church signed a document on "The Sacrament of Baptism as a Sign of Unity", in which the signatories declared their mutual recognition of the validity of baptism. Since 2000 the Committee for Dialogue has been examining the issue of mixed marriages. In 2009 an ecumenical draft concerning such marriages was presented. An important event coordinated by the Bible Society in Poland was the publication in 2001 of an ecumenical translation of the New Testament and the Psalms. Eleven churches were involved in the translation work. Work is currently in progress on an ecumenical translation of the Old Testament. 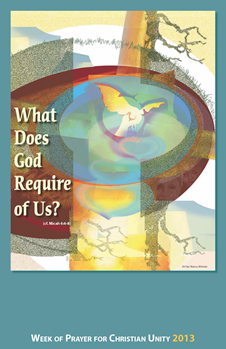 This year (2012) a brochure for the Week of Prayer for Christian Unity has been published for the fifteenth time, prepared jointly by representatives of the PEC and the Roman Catholic Church. In 2009 a book entitled "On The Road To Christ. Christian Churches In Poland Talk About Themselves" was published, in which the churches affiliated in the Polish Ecumenical Council, as well as the Roman Catholic Church, present themselves - for the first time in Polish post-war history, in a single publication. members of churches affiliated in the Polish Ecumenical Council during ecumenical prayers on their pilgrimages to Poland. Currently, seven churches belong to the Polish Ecumenical Council: the Polish Autocephalous Orthodox Church, the Polish Catholic Church, the Old Catholic Mariavite Church, the Evangelical Lutheran Church, the Evangelical Reformed Church, the Evangelical Methodist Church, and the Polish Baptist Union. The Bible Society in Poland and the Social Association of Polish Catholics have affiliated member status.